Situated on the fantastic golf course Southern Dunes and within easy reach of ALL Florida attractions, this villa provides the perfect base for your ideal holiday. Air-conditioned throughout for comfort with all linen and utensils provided. Master bedroom with queen size double bed (new), en suite bathroom (with shower over bath) and walk in wardrobe. Ceiling fan for added comfort. TV also. Two twin rooms each with built in wardrobes + Sleeper sofa (new queen size double) in lounge. Main bathroom with shower over bath, toilet and basin. 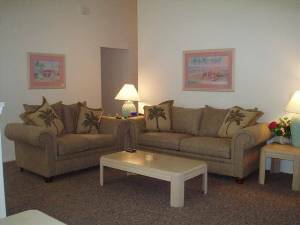 Lounge has comfortable sleeper sofa and Loveseat (both new). Cable TV with VCR and DVD player. Ceiling fan for added comfort. All carpets throughout are new. Kitchen provided with all utensils including oven, hobs, microwave and dishwasher to name main. Decent size single garage where you will also find washer and dryer. FREE internet and FREE phone available and for families, travel cot, high chair, stroller, walker and small selection of baby toys! The swimming pool has been re-surfaced so as new and it is south facing meaning SUNSHINE,SUNSHINE and MORE SUNSHINE! Relaxing view of golf course from the pool. Southern Dunes golf course is an extremely highly rated course and has club shop, bar and restaurant on site. No membership required for use of any facilities. Within easy walk you will find Wal-Mart and Win-Dixie supermarkets, restaurants, bars, take-aways, Blockbusters, shops and all you would need. 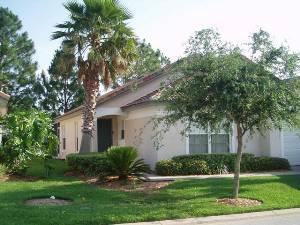 Southern Dunes is an easy 15-20 drive from Disney, 30-40 minute drive from Universal, 40 minute drive from the airport and choice of beaches from 60 minutes simple drive! Kennedy Space Centre 60 minutes also. Of course Florida has endless other attractions and sites also - make the most of exploring! Mickey Mouse is NOT the only resident of Florida!!! We sincerely hope you enjoy staying in our villa as much as we do! 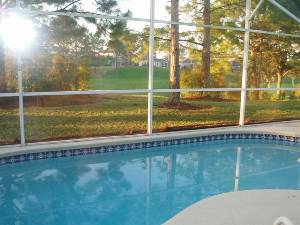 Beautiful clean 3 bed / 2 bath villa with private south facing pool. Quiet and relaxing. 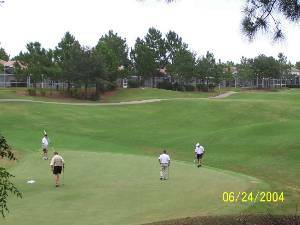 Southern Dunes is an extremely highly rated golf course.